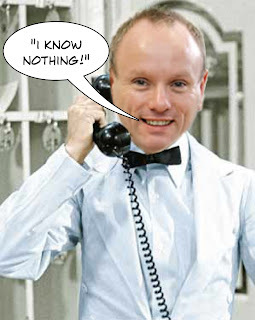 Not The Barnet Times: I Know Nothing! Mike Freer, Leader of Barnet Council, has often been compared to Gordon Brown. Rog T was dropped by the Barnet Times after referring to Cllr Freer as “Stalinist Mr Bean” on his original blog with them. Not The Barnet Times thinks that a better comparison would be with Manuel, the character played by Andrew Sachs in Faulty Towers, famous for his catchphrase “I know nothing” because, if Freer is to be believed, he was completely oblivious to the council’s investment policy which resulted in £27.4 million of taxpayers' money being deposited in failing Icelandic banks. According to the investigation carried out by Deloitte’s, Freer told them that he had “minimal technical knowledge” despite the fact that he had previously been happy to boast to all and sundry that he was a hot shot banker. It is scandalous that Freer can profess ignorance whilst claiming a special responsibility allowance for chairing the resources committee. How can you claim a responsibility allowance if you refuse to take any responsibility? Will Brian Reynolds be next? MEPs. The next great scandal? One law for us. One law for them.